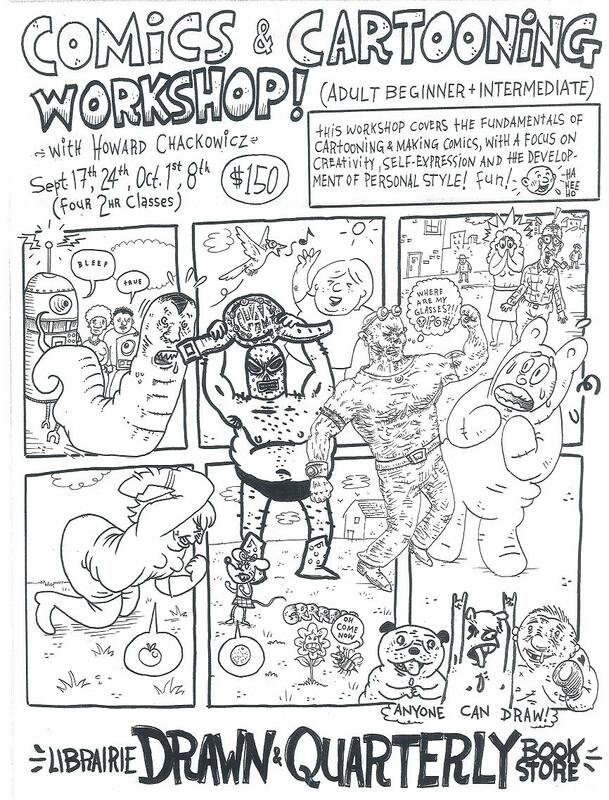 211 Bernard: NEW START DATE for Howard Chackowicz's Comics & Cartooning Workshop: September 24th! NEW START DATE for Howard Chackowicz's Comics & Cartooning Workshop: September 24th! We are super-happy to welcome Mr. Chackowicz back to Librairie Drawn + Quarterly to lead his first workshop for us in a few years! Please note that we have pushed the start date of the workshop series forward one week, to September 24. This means you can still sign up! Give us a call, or come by the store - whatever you do, don't let this chance pass you by! Workshop will be taught in a combination of French and English, depending on participant needs! paper, HB pencil, soft eraser, sharpener, one thin black permanent marker, one thick black permanent marker (eg. STAEDTLER Lumocolor "Fine" and one "Medium" or anything like that) and a ruler. This workshop covers the basics of cartooning and making comics, with a focus on creativity, self-expression and the development of personal style. Cartoon drawing fundamentals (different drawing styles for figures and forms, penciling and inking, lettering, shading, movement, etc.) and comic art basics (developing ideas or narratives, panel and page composition, timing, using word/thought bubbles, etc.) will be explored and then creatively applied. Working with each person's particular style and abilities, participants will complete cartoon pages, a mini comic and a full comic page (or pages)! Though Howard is one of Montreal's most beloved cartoonists (his book "Howie Action Comix" is published by Conundrum Press), you may also be familiar with his work as an actor, musician (Nutsak, American Devices, Land of Kush), restaurant reviewer and, of course, as a regular on CBC Radio One's WireTap alongside other Librairie D+Q faves, Jonathan Goldstein and Jon Tucker! As mentioned, Howard has previously held workshops at our store. He has also taught at the (now defunct) Saidye Bronfman Centre for the Arts, and at French and English schools throughout Quebec for the Montreal English Language School Board, Blue Metropolis and local private businesses. All-in-all, he's got seventeen years of experience teaching comics and cartooning to adults, teens and children in Montreal! LIMITED AMOUNT OF SPOTS AVAILABLE! Come in and sign-up soon!